I finally saw a small pod of coho and a few jumpers a couple of days ago when I was out scouting. That said it was still relatively slow to get excited over this fishery but it at least it gave me hope that it is about to get good especially with no rain in the forecast. Unfortunately, for those fly fishing off the beach the tides are only good for today and Saturday and it do not get good again until Wednesday onwards. However, if you are fishing gear you can fish off the jetty or off a boat so get out there. I saw one get caught on a pink buzz bomb so there are fish around but because they are fresh still they are not showing themselves a lot. We are off to a little bit of a slower start but the coho are definitely big this year, bigger than the usual 3-5 pound fish so when you do catch one its worth it. So if you get a chance to go, always do so as any day, any hour, a school of fish might move in to the estuary and there is no crystal ball to tell us when that is. Thank you to all the students that took my course, hope you will hook some coho off the beach soon. Well we finally saw things pick up a bit this week. 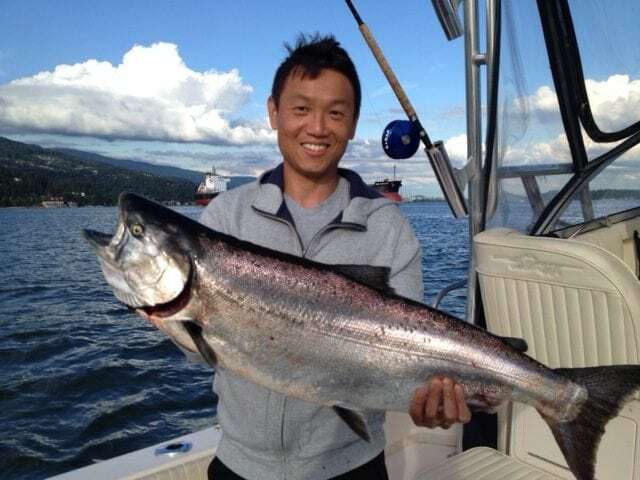 We hooked some nice chinook off the Bell Buoy throughout the week and we also made a few trips over to Gabriola and Nanaimo and came back with some nice chinook from there as well. 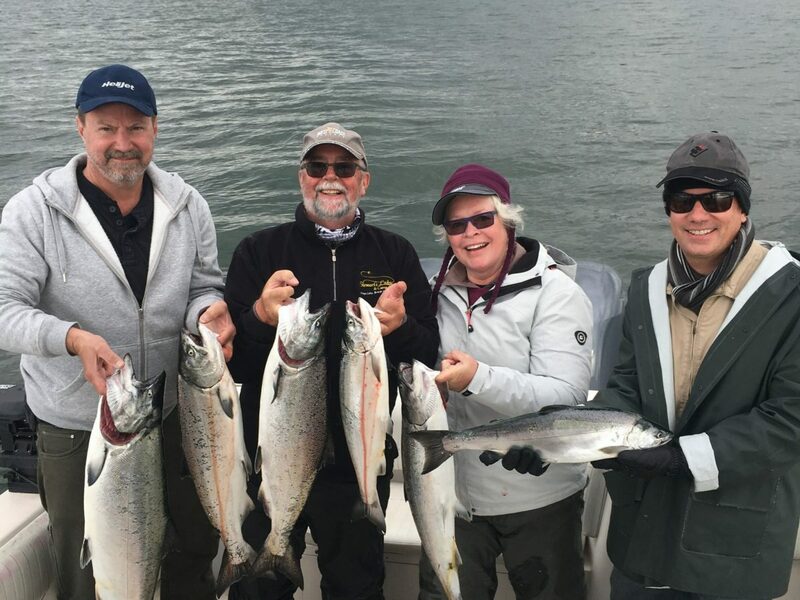 The coho fishing has still been pretty slow but we are patiently waiting for them to arrive. There are reports of schools of coho out in the middle of the Strait of Georgia, roaming around feeding on bait, so these should be showing up along W. Van any day now. Jessica and friend back at the dock with their catch. As mentioned in previous reports, when fishing the Bell Buoy for chinook, glow flashers and bait in a glow teaser head is the ticket. For depths on the downriggers you should be in the 30-80 zone as these fish travel shallow and are basically staging and looking for the mouth of the Fraser River from the Bell Buoy all the way down to the South Arm of the Fraser. We have a good selection of bait teaser heads and glow flashers in stock and we always lots of anchovies and herring in stock as well. 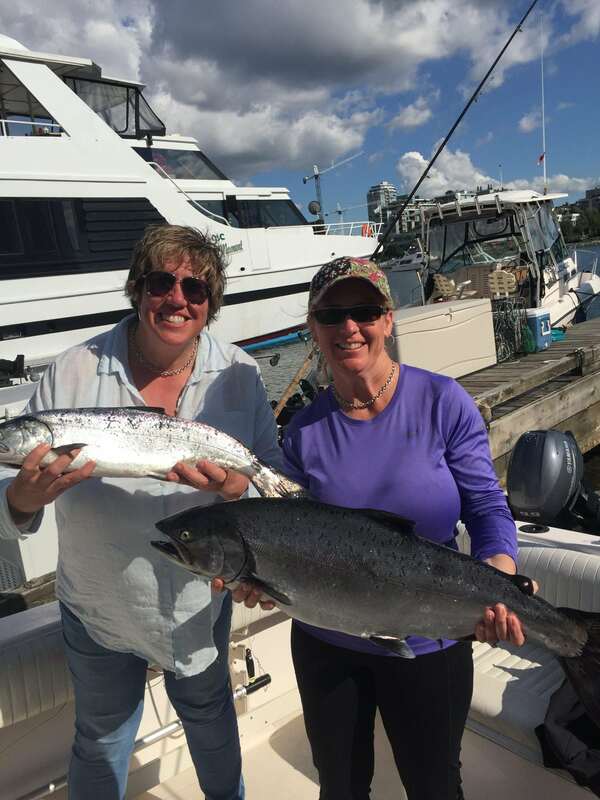 It was nice to see some chinook this week so lets keep our fingers crossed and hope that the coho show up this coming week as they are now getting a little overdue! 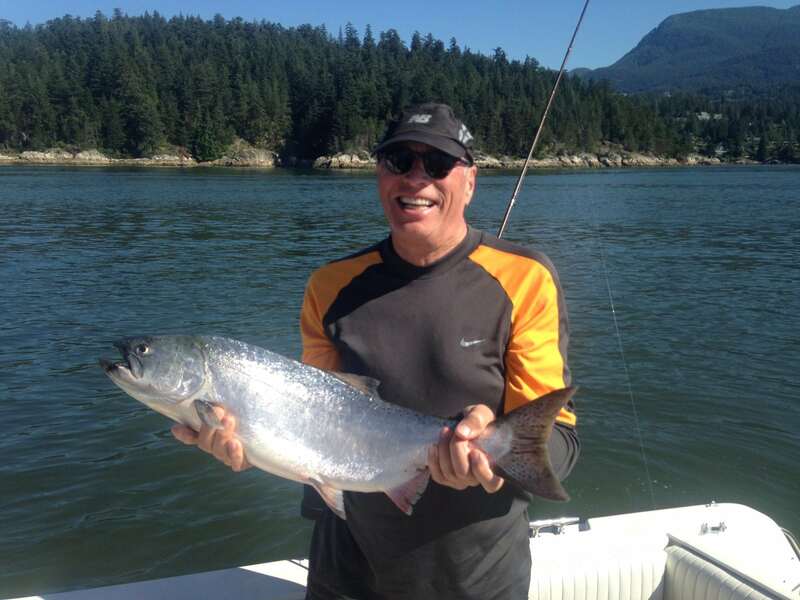 Peter with a chinook landed earlier this week with guide Griffen.